Original art depicting Dracula by Mike Netzer. Actual drawn image size measures 13.5" by 19.2 inches on a like sized art board... Pencil on art board. This piece was originally commissioned by a model company to be drawn by Gene Colan. Colan fell ill and Mike Netzer created this pencil image in the style of Gene Colan. 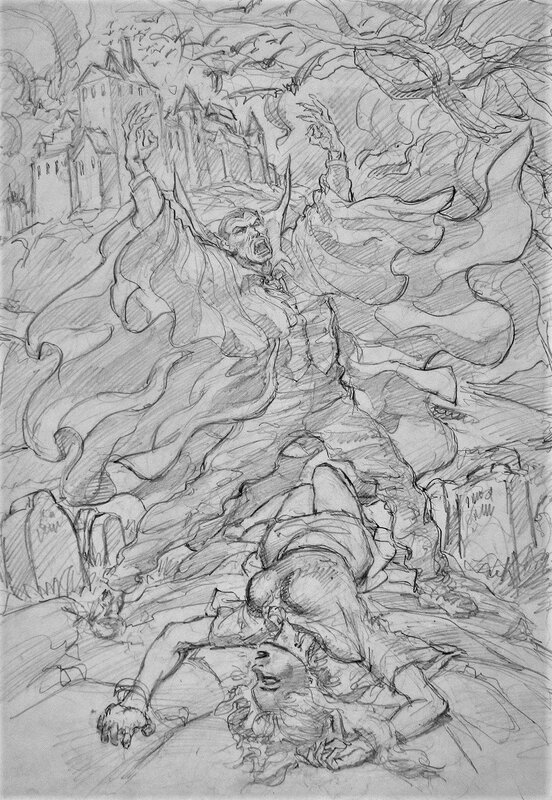 Here are exact words from MIKE NASSER (NETZER) about this artwork: "The pencil art - my layout channeling Gene Colan pencils based on his other Dracula art - was done for Clifford Meth who was representing Gene in the period before he passed away. Gene was very weak at the time. The pencil art/layout (among a few other of Gene's cover recreations) was done so Gene could do a finished pencil over it with little effort. I believe Gene passed away before he got to this one. Last I heard the original was in Clifford's possession but copies of it have been floating on the web. Mike" ALL art on our website (including this one) are able to be purchased with VERY fair time payments, and trades are always considered towards "ANY" art on our website! Just send us an email to mikeburkey@aol.com and we can try to work something out.